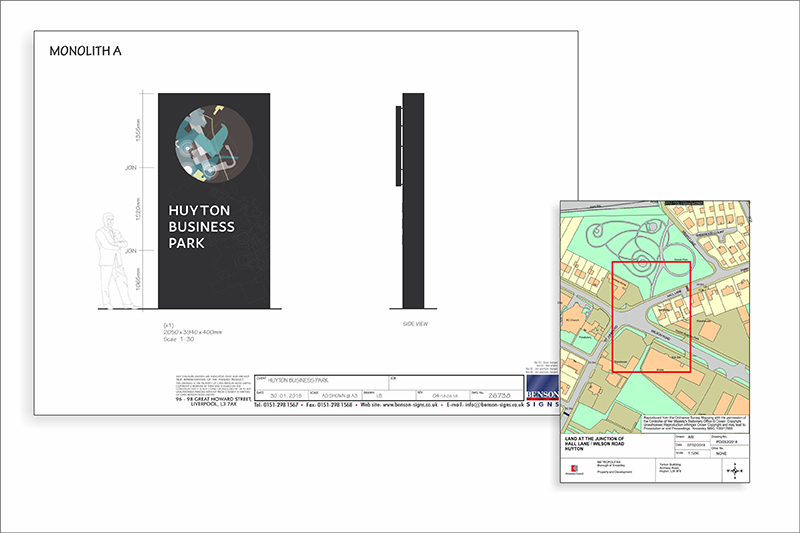 we were again approached by Knowsley council to submit costs on a tender basis for a similar style project for Knowsley business park and Huyton business park. Our tender bid was successful and purchase orders were received to begin work. 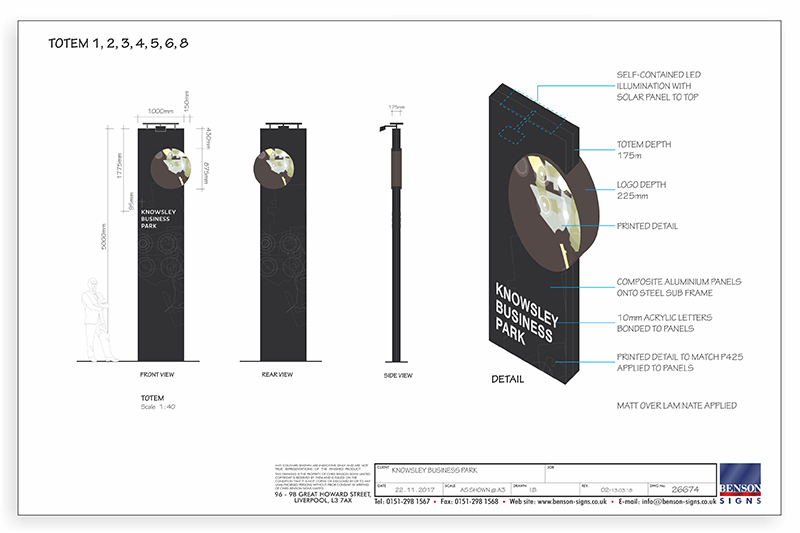 Planning applications were submitted with detailed technical drawings of the proposed manufacture method including materials and fixing positions. Groundworks included steel cages that were set below ground level into concrete blocks to support the monolith signs. 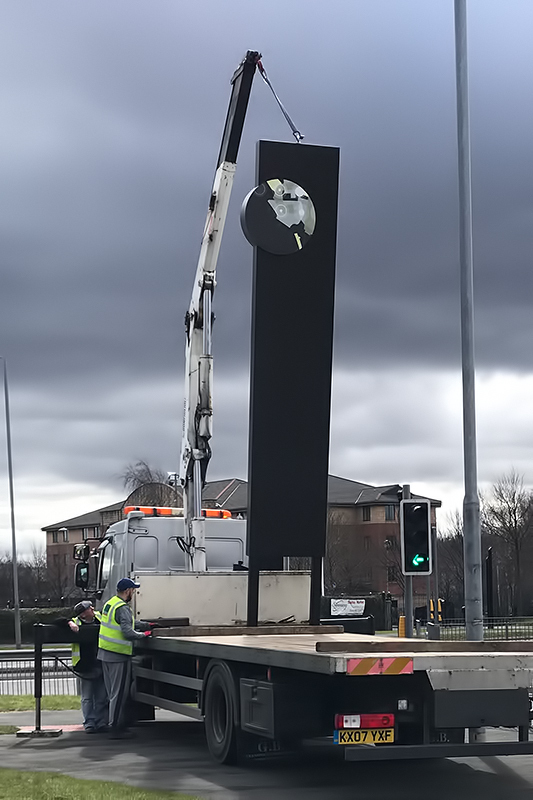 The Knowsley business park signage consisted of seven, 5 metre tall, freestanding totem signs, with solar panel light units fitted to the top. We had used these light units on a trial basis on the previous project and they had been deemed a success. 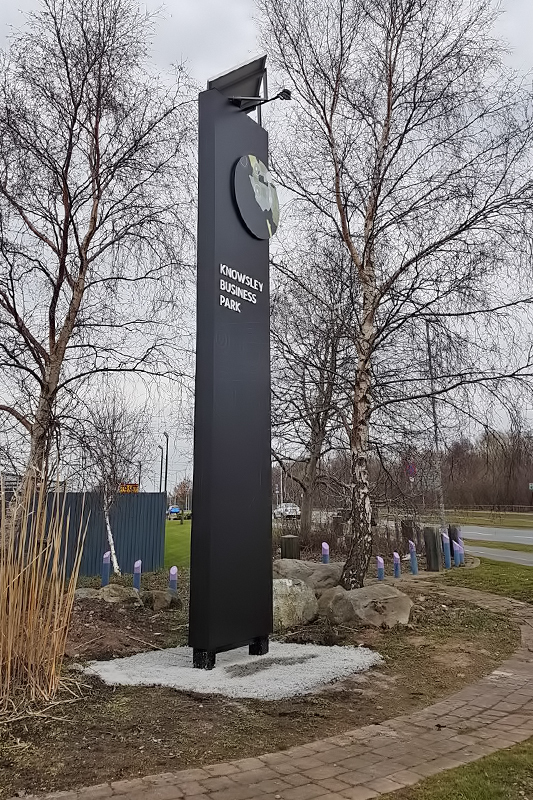 The units were specifically fitted at the optimum angle to receive maximum solar power depending on the fixing position of each individual sign. The steel subframes were fully clad with a ‘skin’ of 3mm black aluminium composite. The circular 3d logos were offset from the edge of the structure giving a seamlessly fitted appearance with added depth. 10mm acrylic, dense white routered letters were bonded to the face of the signs with a laminated digitally printed graphic applied to both sides. The large signs were all manouvered into place using a hiab lifting truck to position them onto their pre-fitted bases. 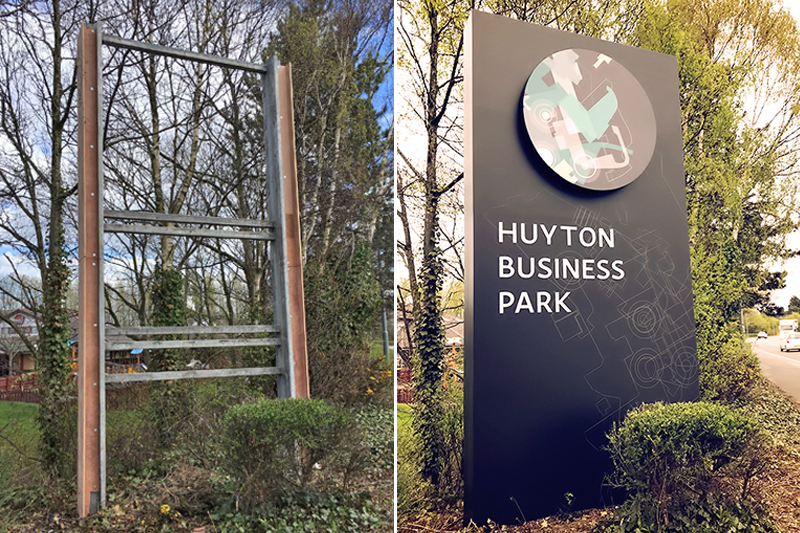 The Huyton business park brief was to replace three, 5 metre tall, 2 metre wide existing freestanding monolith totem signs. It was found on site when a detailed survey was carried out that we could utilise the existing concrete bases and steel subframes. The original signs were stripped back and we were able to re-clad the existing sub-frames with brand new signs on the outside whilst retaining the infrasture of the old. This made a huge saving for the client who were delighted with the new signs when they were fixed into place. Freestanding Totem Signs manufactured for local business parks.